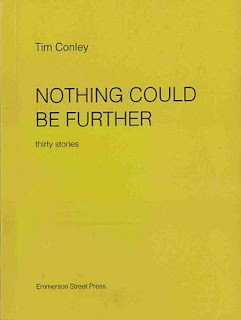 Tim Conley's latest short story collection is Nothing Could Be Further (Emmerson Street Press, 2011). 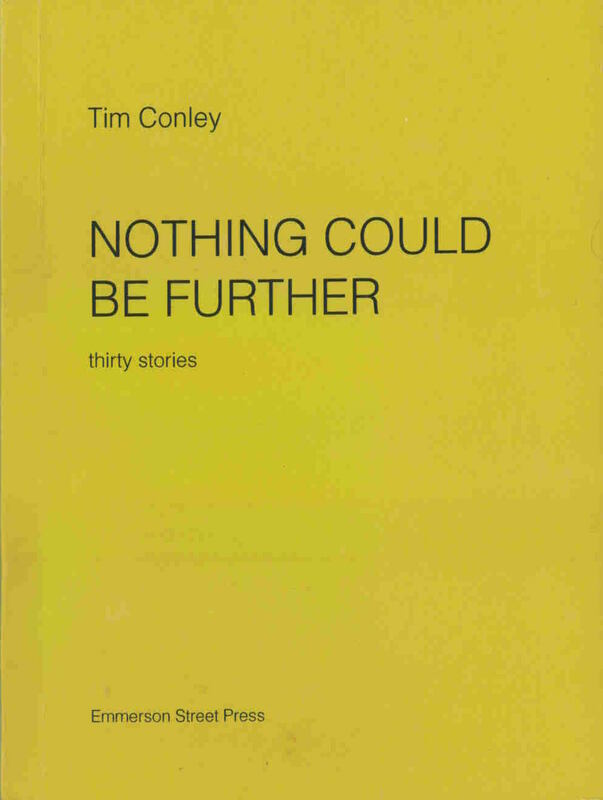 The title to your new short story collection, NOTHING COULD BE FURTHER, completes itself subliminally with "from the truth." I read this as a kind of affirmation of fiction as fiction (i.e., as an art that doesn't tie back to a grounded "reality" or "truth"). And the stories are fabulous and fable-like (i.e., excellent and take place in a world similar but distinct from our own). So the question is something like, how would you describe your approach to the short story? Or what is your interest in creating other worlds? The title phrase could also be concluded “from my mind,” and in both cases the disavowal might seem a little suspicious, a little absurd (I think of the White Knight praising Alice for having such good eyesight so as to see “nothing”). Fragmented in this way, though, the phrase has a wistful sort of half-promise or expectation to it: “nothing could be just up ahead.” Whatever that might mean. I’m not at all suggesting that fiction has no connection to reality, if by “reality” (a word Nabokov rightly said must always be kept in quotation marks) we understand this to be a perceptible phenomenon. Put another way, I don’t hold that imagination and perception are irreconcilable – on the contrary, I think that we are most deceived when we suppose we behold the world without any imagination involved in that process. Fiction, then, ought not to be understood as a surmounting of or escape from reality, but a retuning of it, however fine or subtle or radical or ridiculous. The decorum of the royal court is a recurring theme in these stories. This seems both a throw-back to, to be most obvious, Shakespeare, but also a way to query the way language influences and even controls human relationships. These stories are both funny and intricate (and delightfully beyond television; what I mean is their focus on language is arguably beyond the over-simplified image, beyond what the camera can capture). Their courtliness is also charming. I'd like to hear something from you on this subject, but I'm having trouble putting that into a question. As a professor of English Literature, I wonder if you despair for the indecorous incivility that is CNN, The Toronto Star, et al, and what passes for what's left of the public square? That’s an unexpected question, or more accurately a series of questions, and I’ll take them in reverse order to try to end where you began. The first answer is a yes and no. Yes, there is good reason to be alarmed at the state of public discourse, for there’s plenty of discourse but less and less meaningful public involvement. The public square has been replaced by shopping malls, an entirely privatized commercial space that apes civic virtues and seems to deceive many on that score. The state of publishing is so bad that I despair to go into detail, but basically the general narrowing of aesthetic experimentation reflects the shrinking concentration of publishers, who because they have more at stake and want to maximize profit with every enterprise, are ever more averse to risk. But as for decorum, no, that doesn’t much concern me. Sure, when I scan the “comments” to online news articles and see the reactionary, semi-literate barkings of jackals, it’s a temptation to get depressed, but again, look at how meaningless that forum is. Nothing one says in such places about, say, such and such a government initiative is going to affect the government, which knows full well that it doesn’t have to listen to anybody when it isn’t an election year (if then). Imagine a load of people squeezed into a tight cell, where every movement puts somebody’s elbow into somebody else’s back and everyone is stepping on everyone else. If in this writhing mass one voice were to call out for some decorum, please, the best that might be hoped for is some unifying laughter. The problem is the cell, but it is easy for the prisoners to forget that or assume they can do nothing about that and instead vent their frustrations on one another. Writers, like anybody else, can either accept the cell as the given world (natural, just, unchangeable), which can in effect mean ignoring it or, worse, praising it, or else they can try to measure and even challenge that confinement. The best writers, the ones that are most important to us, open up the room and enrich the discussion about how to open it up even more. I hadn’t really thought of the “courtly” element in NCBF, but I can see what you mean about at least a couple of stories in there. I guess I’m attracted to different discursive forms and like to sample and explore them. In some ways the book might be a jukebox of idioms. Greatest genre on earth? Surely not; and besides, that sort of braggadocio is precisely what short fiction doesn’t do; it is precisely not a giant claim or sweeping statement (on the other hand, the novel is especially given to these gestures). And I’m not sure I have a favourite genre, and would prefer to see genres dissolved wherever possible. When people refer to my work as “short stories,” I try to smile and tell myself that they must know what they’re talking about, but that doesn’t mean I have to be comfortable with it. Take something like James Kelman’s “Remember Young Cecil.” Besides being note-perfect in its intonations, it is a marvellous snapshot of billiards-at-the-pub culture, in its way as much a straight documentary of a side of Scottish male life, with all of its jostling anxieties and pleasures, as it is an invention. And I, as a reader, don’t have to choose between the two. That’s exciting. So I may be praising short fiction for –when it’s at its best– not being a definite genre at all.